On a clear and sunny day the La Pérouse peninsula within Kamay Botany Bay National Park, the northern headland of Botany Bay gives a grand view of the broad expanse of Botany Bay with the shipping Port on our right and overhead a stream of aircraft making their approaches to Sydney Airport. Just offshore is the old military outpost of Bare Island, where scuba divers were suiting up for their dive in the deep waters and reefs that surround the island and the peninsula - considered to be one of the best scuba diving sites in New South Wales. At the recommendation of Sir Joseph Banks, Botany Bay was the destination of the First Fleet and where the eleven ship dropped anchor between 18 January and 20 January 1788. 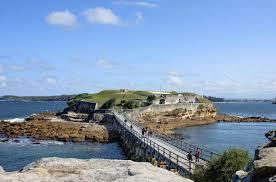 The arrival of La Pérouse’s expedition on 26th January coincided with the relocation of the First Fleet north to Port Jackson. Captain Phillip ordered the captains of HMS Sirius and Supply to meet with the French, a meeting that was cordial and followed normal protocols, and during which La Pérouse requested that his journals and letters be sent back France with an outward bound British ship. Inspired by the voyages of Captain James Cook, King Louis XVI of France had commissioned La Pérouse to lead a scientific exploration of the South Pacific Ocean in command of his two ships, Astrolabe and Boussole. After a stay of six weeks, lookouts stationed at the South Head of Port Jackson made the last official sighting of the French expedition in March 1788 as the ships sailed from Botany Bay. The French expedition was wrecked on the Solomon Island reefs around April or May 1788. The circumstances surrounding their disappearance remained a mystery until the wreckage of the ships were discovered in 1964; successive missions were mounted to confirm identification. The La Pérouse monument dominates the headland, a grand memorial to the French navigator Jean-François de Galaup, comte de La Pérouse. Nearby is the distinctive Museum, which only opens on Sundays - historically significant as it is housed within the Cable Station, once Australia’s only communication link to the outside world. On a low hill is the Macquarie Watchtower c.1820, the earliest known surviving, sandstone tower building and the oldest surviving watchtower in Australia – thought to have been commissioned by Governor Macquarie. It is also the only known tower specifically constructed for colonial border protection and the prevention of smuggling. 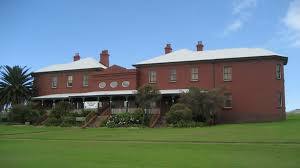 It became the first Customs outstation in Australia in 1829 and operated as a Customs Station until 1903. Within the vast Eastern Suburbs Memorial Park & Cemetery, Matraville, is Pioneer Memorial Park and its recent addition of the First Fleeters Memorial - Memorials of Early Pioneers, opened on 13th May 2016. Eleven granite panels on the perimeter are etched with the ships’ names, each listing the names of those who sailed with the Fleet. There are twelve First Fleeters reinterred here: Isaac Archer, Sarah Burdo/Archer, Frances Davis/Mintz, Elizabeth Ans/Vandercom, Mary Marshall Snr, John Nicols, Thomas Prior, Hannah Smith/Pugh, James Squire, John Trace, William Tyrrill, and each has a panel telling the individual stories of their successes or otherwise in the colony. The life-like statue of Admiral Arthur Phillip is seated on a granite bench at the “stern of the Friendship” along with one of his greyhounds, Chara, that he brought with him on the voyage. At the bow is a standing statue of Captain James Cook heralding his discovery of the east coast of Australia. A full size granite replica of the anchor of the HMS Sirius is also featured together with a ship’s wheel, the centre of which is a map showing the route of the First Fleet. The First Fleet memorial area is well-tended – as is the whole of this attractive cemetery – a peaceful and moving place to honour the First Fleeters. A new addition – the installation of squares around the inside perimeter into which can be placed memorial plaques.